Bring on Peyton Manning and the Denver Broncos. Cam Newton and the Carolina Panthers are ready for the Super Bowl, too. Newton is headed to his first Super Bowl after an MVP-like performance, running and passing the Panthers to a 49-15 rout of the Arizona Cardinals in the NFC championship game on Sunday night. In the AFC title game, 39-year-old Peyton Manning threw two TD passes and Denver's defense pounded Tom Brady all day as the Broncos beat the New England Patriots 20-18 after intercepting a potential game-tying 2-point conversion pass by Brady with 12 seconds left. In Charlotte, North Carolina, the Panthers came up with seven turnovers, including Luke Kuechly returning an interception 22 yards for a touchdown with just over five minutes left in the game. Cardinals quarterback Carson Palmer threw four interceptions. Newton had a stellar day completing 19 of 28 passes for 335 yards and two touchdowns and also ran for 47 yards and two scores in dabbing his way to the NFL title game. 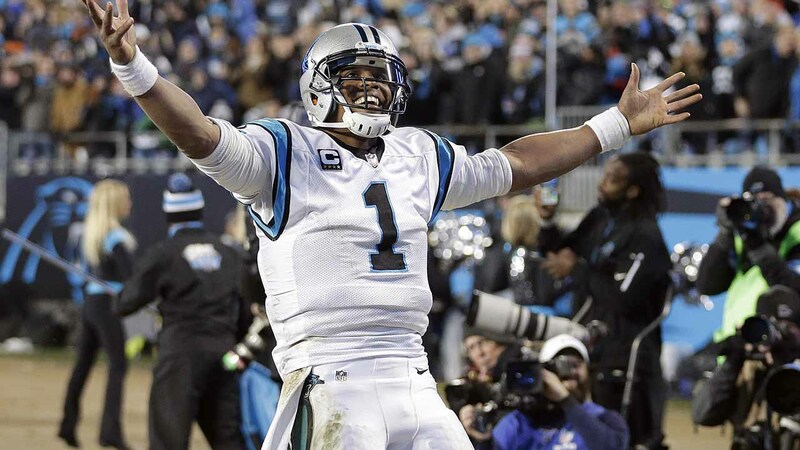 The Panthers, with the best record in the NFL at 17-1, will be playing in their second Super Bowl. The Broncos (14-4) are set for their eighth title game. The 39-year-old Manning, who could be playing in his final game, is set for his fourth Super Bowl - two with Indianapolis and now his second in four years with the Broncos. The Super Bowl is Feb. 7 in Santa Clara, California.